Even before my daughter became a Brownie, I would stalk local grocery stores and malls for girls sporting bemedaled green sashes sitting behind a table piled high with those familiar colorful boxes. 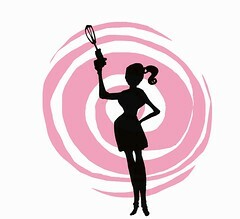 I loved them all – Shortbread, Thin Mints, Tagalongs and of course, my particular favorite, Samoas (which is also known as Caramel De-lites). Alas, these cookies are only available during late winter and early spring in my area, so by November, my stockpile of frozen cookies has long been depleted. 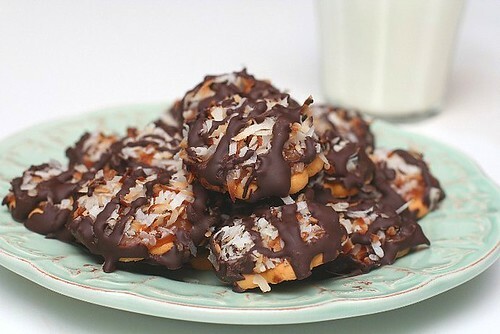 Samoas consist of a cookie base, caramel, toasted coconut and chocolate stripes on top. I had some extra homemade caramel and decided to make my own stash of Samoas. 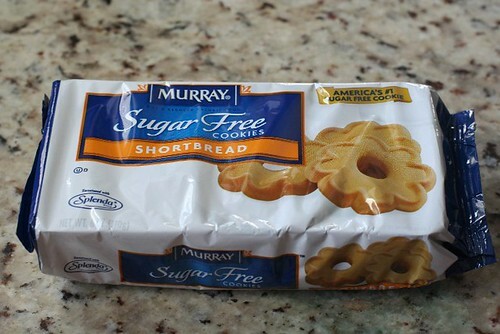 I bought sugar free shortbread cookies, mainly because I liked the shape and size, not because it was sugar free. The caramel is very sweet, so I thought all the better. You might want to avoid any cookies with a hole since the caramel will drip through, unless you coat the bottom of the cookie in chocolate (like the original). Set oven on low broil. Toast coconut on a baking sheet on the lowest rack for 3 minutes or so. 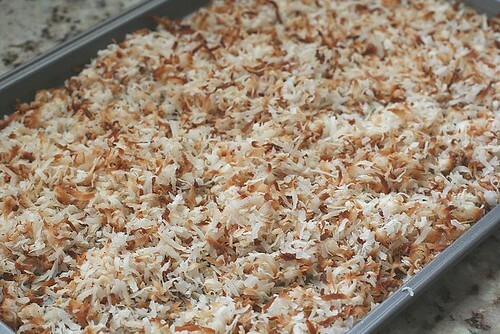 Mix coconut to toast evenly and broil for 3 minutes more, being careful to not burn. 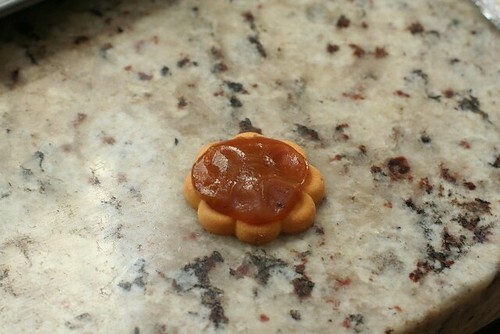 Cut out 1/2″ tall nickle-size circles of caramel and flatten on top of the cookie. Top with toasted cococut. Melt chocolate in a metal bowl over a saucepan of simmering water, stirring occassionally until smooth. (or use a super fancy chocolate tempering machine like me). 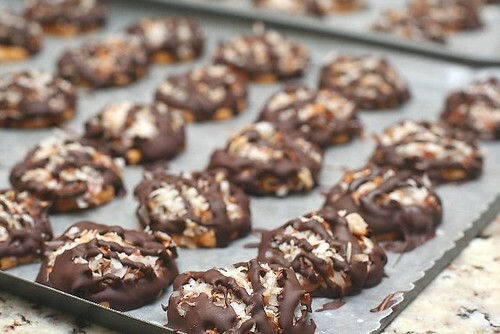 Holding the coconut-topped cookie carefully, drizzle chocolate on top of the coconut. Place cookies on wax or parchment paper to set. This is a funny idea, I’ve always resorted to freezing girl scout cookies, but doing it this way would yield a much fresher product. These would be a nice gift for the holidays, too :). You are amazing. These look so yummy, and are my favorites too. Oh my gosh the caramel is TOO die for! These are one of my absolute favorite cookies. I’ve never thought to try them homemade! How sad… it’s almost midnight, I should be in bed… I want cookies!